Meet Rev. Rebecca L. Holland, M.Div. O.S.L. Rev. Rebecca Torres-Holland graduated in 2011 with a B.S. in English Education. After graduation, she went on to attend Wesley Theological Seminary in Washington D.C. where she earned her Master’s of Divinity in 2014. While at Wesley Seminary Rebecca served as a pastoral intern at a cooperative parish where she gained experience working with both a large congregation in a prosperous area of the city as well as a smaller and more ethnically diverse congregation. Rev. Rebecca is currently working on a nonfiction book about the importance of helping people to articulate and share their stories. 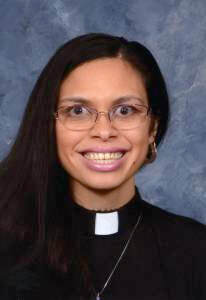 It is her goal to help to use her voice in order to help to create spaces in the church for people who have been traditionally marginalized, especially women, people of color, and people with disabilities. Rebecca is a voracious reader and particularly enjoys poetry, eighteenth century literature, and women’s history. She also has a soft spot for genre fiction, especially science-fiction, fantasy, and Georgian romances. She is the proud mom to a chubby chihuahua and a very grumpy cat.